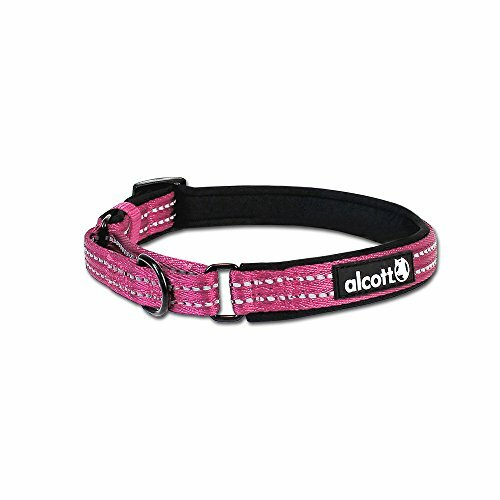 alcott Martingale Collars are designed for a lifetime of adventure! Featuring highly visible reflective stitching and super comfortable black neoprene padding, these adjustable collars have an integrated black metal D-ring for a secure leash connection walk after walk. If you're looking for a more comfortable alternative to a choke collar or if your dog slips out of their regular collar, then a martingale collar is a perfection solution! They are available in 3 sizes and vibrant nylon colors that have a subtle chevron weaving pattern. Small collars have 5/8" wide nylon and adjust from 10" to 14", medium collars have 3/4" wide nylon and adjust 14" to 20" and large collars have 1" wide nylon and adjust 18" to 26". Matching nylon leashes, harnesses and retractable leashes are also available from alcott! Adjusts Easily to Fit 14" to 20"
If you have any questions about this product by Alcott, contact us by completing and submitting the form below. If you are looking for a specif part number, please include it with your message.